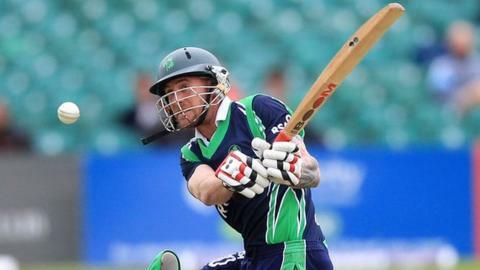 Ireland all-rounder John Mooney will make a return to international cricket in next month's three-match one-day series against Scotland. Dubliner Mooney, 32, has not played for Ireland since leaving their tour of West Indies in February because of a stress-related illness. Mooney returns with Kevin O'Brien, George Dockrell and Max Sorensen. Regular skipper William Porterfield is among a number of county-tied players who will miss the series. Ed Joyce and Niall O'Brien are also unavailable and with Porterfield missing, Kevin O'Brien will captain Ireland having recently returned from playing in the Caribbean Premier League. Mooney's absence from the international scene saw him miss the World Twenty20 tournament in Bangladesh and the games against Sri Lanka in May. However, the North County player is now set to add to his 71 Ireland appearances in the matches against Scotland at Malahide on 8, 10 and 12 September. Series skipper O'Brien says the three games will form an important part of Ireland's preparations for next year's World Cup. "There are still places up for grabs and everyone is working really hard to make sure they are part of what is sure to be a fantastic event," said O'Brien. "Scotland are ever improving over the last few years and have a vibrant young squad mixed in with some experienced players, like Majid Haq and Richie Berrington." Durham wicketkeeper Stuart Poynter retains his place in the Ireland squad following a superb century against Sri Lanka A while Gloucestershire seamer Graeme McCarter and Middlesex all-rounder Andrew Balbirnie are also included.